In the endless leapfrogging to create the largest available wind turbine for offshore deployment Vestas seems to be inching ahead with its V164-8MW. After a successful run on test in Østerild the giant machine looks set to reach its next milestone – commercial deployment in the UK North Sea. Vestas' first V164-8.0 MW prototype wind turbine, currently installed at the Østerild test site, produced its first kWh of electricity, making it the world's most powerful turbine in operation. ‘We have now completed the production, testing, and installation of the V164-8.0 MW as planned, thanks to the team's intense effort during a time when Vestas has reduced its investments and lowered fixed costs. We now look forward to evaluating the turbine's performance on site,' commented Vestas' chief technology officer Anders Vedel. The turbine, which has been installed at the Danish National Test Centre for Large Wind Turbines, will be closely monitored in the coming months to validate reliability and energy output. Reaching the operational phase is a key milestone in Vestas' plans to boost its business and take advantage of opportunities in the offshore wind sector, where turbine unit sizes are increasing. "The V164-8.0 MW will be the flagship product for the offshore joint venture between Vestas and Mitsubishi Heavy Industries." Recently, its competitors Gamesa and Areva announced plans to merge their offshore wind businesses in a bid to accelerate technolog development, particularly their 5 MW and 8 MW turbine platforms. 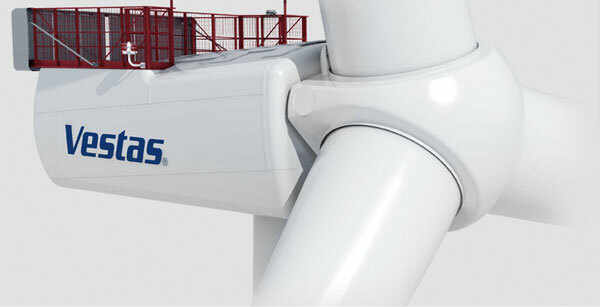 The V164-8.0 MW will be the flagship product for the offshore joint venture between Vestas and Mitsubishi Heavy Industries. The turbine at Østerild is mounted on a 140 metre tower, has a tip height of 220 metres and a swept area of more than 21000 m2. The object is to increase the amount of energy captured while reducing operational and maintenance costs by enabling customers to run fewer, larger turbines, with fewer service visits. Given a suitably large pipeline of orders, serial production of the V164-8.0 MW turbine can begin in 2015. Pre-installation, testing of key components at three different sites began some months ago with tests on individual components, systems and integration, for performance, robustness, reliability & compliance. Testing of the pitch system and blade bearings took place at the company's facility on the Isle of Wright, UK, prototype assembly at its site in Lind, Denmark, while drive train arrangement and assembly was carried out at the test centre in Aarhus, Denmark. 8.0 MW generator is designed to suit the harsh conditions in the North Sea area, resulting in greater annual energy production for a given investment. Fewer turbines are needed which reduces the cost of transportation, foundations, installation, cabling, service and maintenance. With its 25-year structural design life, aimed at allowing the longest possible period per unit in which to generate energy, the V164-8.0 MW is designed to require as little maintenance as possible, and when servicing is required, it is, says Vestas, safe, quick and cost efficient. "This WTG has not been adapted from an onshore equivalent"
This WTG has not been adapted from an onshore equivalent. From first to last, says Vestas, it has been designed with offshore conditions in mind. The challenges associated with harvesting offshore wind power are clear - the large scale of projects, the distance from shore, an environment that is generally far more hostile than it is onshore, as well as being windier; and the depths of installation and risks to safety inherent in an offshore environment. Turbines typically represent around one-third of the total capital expenditure of an offshore project. However logistical decisions, such as the weight and size of the turbine components, and service access, have a significant impact on other costs along the value chain, such as foundation costs, transport, construction and installation, service and maintenance. Maximising the cost efficiency of a wind power plant therefore means taking a project-level approach to these critical factors, rather than simply considering them at an individual turbine level. The first commercial outing for the new WTG is likely to be at the extension to Dong Energy's Burbo Bank wind farm, located in Liverpool Bay, on the west coast of the UK, for which Vestas has been chosen as the preferred supplier. The choice of the 8 MW unit is subject to the windfarm's being awarded a Contract for Difference under the UK government's EMR FID-enabling regime, and to the parties agreeing on a detailed supply agreement which is expected to be signed later this year. "Based on the expected permitting process and timetable for the offshore wind farm, installation could get under way in H2 of 2016." “The performance of the 8 MW turbine from Vestas is very promising. I see this as a very concrete step towards reducing the cost of electricity from offshore wind. A competitive market for all components is essential to accomplishing this. I look forward to working with Vestas and the other members of our supply chain to find further reductions in the cost of electricity," commented Samuel Leupold, executive vp at Dong Energy. In December 2012 Dong Energy and Vestas entered into an agreement to co-operate on a number of test activities for the prototype of the V164-8.0 MW at the test centre in Østerild to accelerate the development of the turbine. The Burbo Bank Extension has a maximum capacity of 258 MW and is located 7 km off the English coast adjacent to the existing Burbo Bank wind farm which has a capacity of 90 MW. Based on the expected permitting process and timetable for the offshore wind farm, installation could get under way in H2 of 2016. Dong has not yet taken a final investment decision to build the facility. The V164-8MW on test at Vestas’ Østerild facility. Close-up of the V164-8MW wind turbine on test at Vestas’ Østerild facility. V164-8MW wind turbine on test at Vestas’ Østerild facility. Main components of the V164 nacelle. V164-8MW expected annual yield assuming 100% availability, 0% losses, wind speed at hub height.